The grass was green and life seemed so simple. There were many shops with people selling their crops and other items. There were small children in tattered clothing who were carrying their younger siblings on their back. People were staring at us and at the same time very welcoming. They knew we were there to help. I looked around the clinic site and saw the cement floors, red dirt, and bunk beds in which we would sleep 8 per room. There was no running water or bathrooms and we would have to pump water from a well, but this was home for two weeks. I awoke in the morning to join the group up by the picnic tables for breakfast. As I walked outside and looked at the clinic, I was overwhelmed as I saw over one hundred pairs of eyes staring back at me. 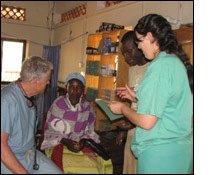 The Ugandan people who had come to be treated had been at the clinic patiently waiting for us since six o'clock. I felt a rush of excitement and was ready to begin the long day. The translators were working hard in helping us to communicate. People came in with children lying in their arms, dehydrated, feverish, and in need of medical care. There were hundreds of children within the weeks who had malaria. One child had fallen on wood three months ago and had what was thought to be an abscess until I opened it and found a four inch splinter. A mother brought in her child with a large lump on the arm, an abscess in which I drained. Children were given de-worming agents on arrival and fluoride treatments while waiting. Adults waited patiently with no complaints. There were a wide range of complaints from back pain to hypertension and diabetes. One man came in with enlarged lymph nodes and after being tested was diagnosed with HIV. Women came in with abdominal pain and had positive pregnancy tests. One of the most touching experiences was a woman who brought in her 4 children. Two of them had malaria and another she had found on the side of the road and was caring for her. She was most concerned about this new child she took on and felt " she is sick". The child had signs of cerebral palsy. This was explained to the mother. She had named the child "Hope". The day after I had seen her and her children she came back to the clinic in dirty, torn clothes and brought me a bag of mangos to show her appreciation. This experience grounded me once again and made me realize why I went into medicine. My goal was to help those in need. There was no monetary incentive, but only room for a heart to help the next person that was carried lifeless into the clinic. My life will be forever changed.